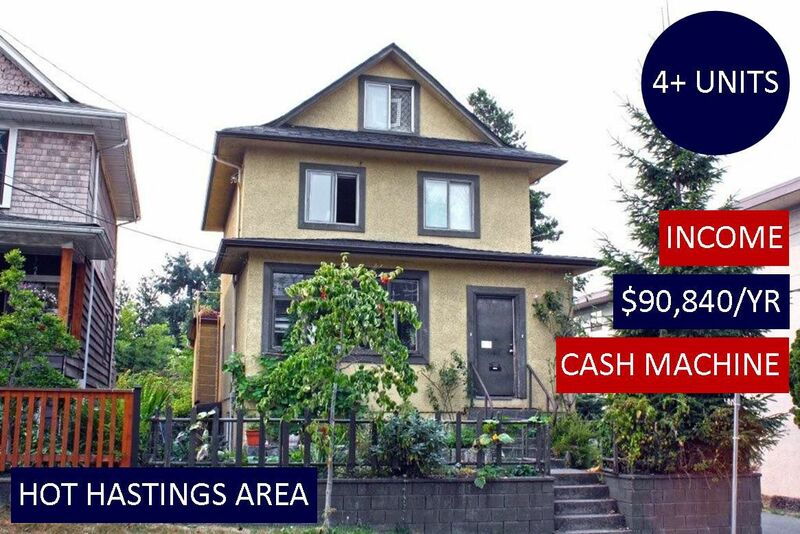 Hastings Area Character Cash Machine, 4 level 4050 sq.ft. 4+ Unit Multi Suite house. $90,840/yr Gross Income (rents below market) from 1, 2, 3, & 4 bdrm self contained suites. house is in decent condition w/big decks, Water, Mtn & City views, 2 car garage, & sits on a 33'x99' corner RM-3 lot across from Pandora Park in fast upcoming Cedar Cove neighbourhood - identified in new COV Grandview Woodland Plan as potential for 6 storey rental development - see attachment. 1.5 Blocks to restaurants, shopping, public transport, this property is a great long term investment & holding property with opportunity to add value quickly. It is also good for owner occupiers, shared ownership & developers. Contact LS for info pkg, floor plan. All Showings by apt with 48 hrs notice please.